Our large state of the art serial production facility is constantly being improved to meet the ever changing demands of our global OEM customers. With a vertically-integrated production facility comprised of nearly 250,000 ft2 of manufacturing space, finished goods warehousing (for VMI customers under contract), fully craned drive in load/unload, as well as a world-class Technology-Center, we are ready, willing and able to meet the unique challenges of the many markets we serve. UAI leverages its AccuFAB Ncell Professional 7 to produce more, faster, for less. The Ncell nesting solution offers a single, cohesive automated production environment that reduces production time, improves material utilization and streamlines laser, plasma, punch and shear manufacturing processes. Employing Ncell allows UAI to dynamically nest parts, getting the right part at the right time – key to streamlining production, dramatically reducing waste and increasing productivity. Our laser cutting work centers offer ultimate manufacturing productivity with your fabrication cutting requirements – speed, versatility and repeatable precision are achieved with 24/7 operating capacity availability. Operating on the principle of “flying optics”, the non-contact cutting head moves while the workpiece stays stationary to ensure maximum performance and exceptional cut edge quality. 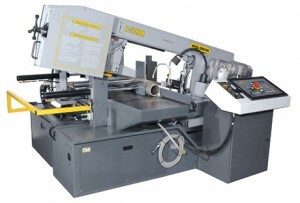 CINCINNATI CL 707 Laser Cutting Machine with 72” x 144” cutting bed. Can cut ½” mild steel, 7 gauge stainless steel and ¼” aluminum. Two (2) x MITSUBISHI RX 4020RX-45CF-R Laser, with 4500 Watts of cutting capacity. Can cut 1” mild steel, ½” stainless steel and 3/8” aluminum on a 80” x 160” table. 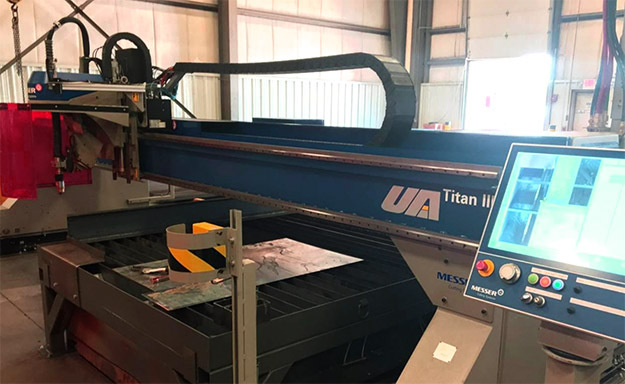 UAI’s Titan III is designed for plasma cutting and weld prep beveling using the Deltae rotator. The bevel angle is derived automatically using a combination of A-Axis and C-Axis interpolation by the CNC using unique compound skew technology from Messer Cutting Systems. The Titan III along with HPR 400XD HyPerformance Plasma cuts fine-feature parts up to 3.2” with superior quality and consistency, eliminating the cost of secondary operations. OmniWin nesting and beveling off-line software. CNC Press Brakes combine precision forming capabilities with leading edge control technology. The AUTOFORM+ is highly versatile and can handle sheet metal or plate and can form complex multi-bend or simple single bend parts with ultimate precision. High speed, accurate and repeatable punching is achieved approaching 1,000 HPM and 400 HPM on 1” centers provided by AMADA’s unique servo-controlled hydraulic ram. High speed tables position at 5,000 IPM, and 3 auto index stations provide maximum flexibility by simplifying tooling inventories and dramatically reducing tool setup time. In addition, the Power Hydraulic Numerical Control (PHNC) calculates the optimum punching speed and hydraulic pressure of the ram stroke cycle. Production speeds are maximized and noise levels minimized. 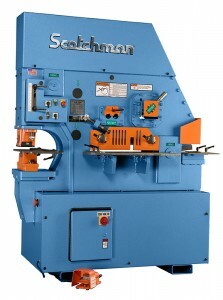 The classic shear will yield more accurately cut parts per hour and will provide a superior quality blank. The Cincinnati brand is known for durability, meaning greater machine uptime and keeping the price of your fabrication competitive. Our Horizontal CNC FICEP Drill Line provides high speed, precision CNC drilling operations for custom structural drilling and tapping requirements. This allows us to perfect the drilling operation – accuracy and repeatability – on I beams, channels, angles and tubes from the “old style” manual, inaccurate, “layout and drill method” of structural shapes to a precision CNC drilling operation. At UAI’s, 100% of our welders are AWS D1.1 certified and many are D1.3 and CWI certified as well, delivering consistent quality on customer requirements. 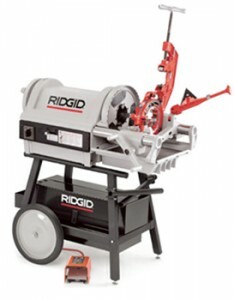 Built-in pulsed MIG (GMAW-P) welding capability with swing arc arms, dual digital meters, and microprocessor-based technology guarantee efficiency for your job. The pulsed spray transfer helps reduce spatter and fume levels as well. Our pride in craftsmanship, highly qualified team, process capabilities and attention to detail reliably produce serial production products our customers can count on. 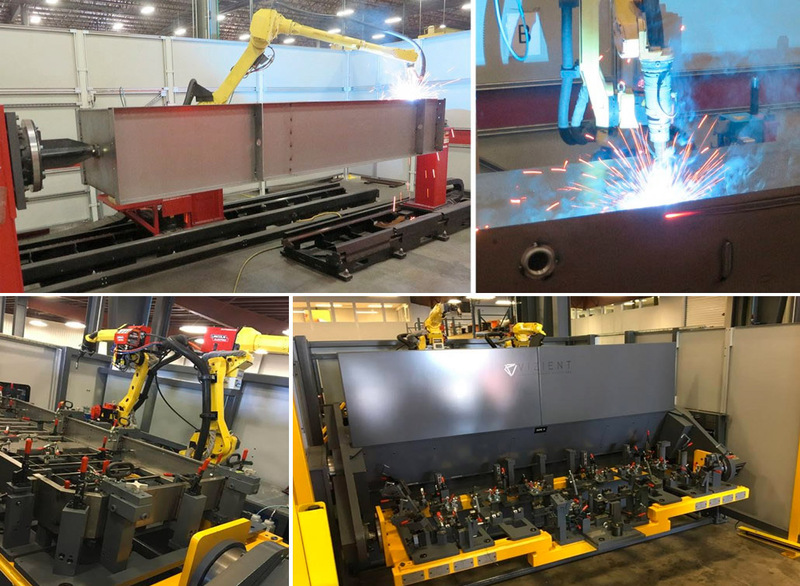 World-class capability in robotic welding is a product of our status as a leader in the manufacture of complex products requiring consistent close tolerance performance. 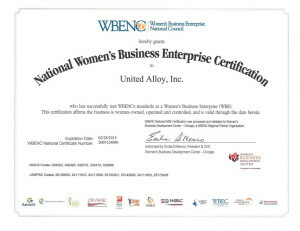 Every UAI customer reaps the benefit of an engineering team with experience on 10,000+ CAD/CAM projects, along with fully automated robotic production cells that reliably reproduce welds including the most complex angles, curves, arcs and intricate welds with astounding accuracy, repeatability, operational efficiency and a reduction in component costs. We take special pride in designing ideal production processes in partnership with our customers to meet and exceed their expectations. It’s no wonder that global Fortune 100 OEMs regularly come to UAI to tackle their toughest challenges. Our efficient and versatile G.E. Schmidt Proline dual headed projection welder offers UAI highly accurate and fast process capabilities to position and weldnuts in location. Powder painting provides an industry leading superior finish and long term performance to all products subject to the elements. UAI has two of the largest and most advanced conveyorized powder coating systems in the Midwest, giving UAI unparalleled capabilities and capacity. 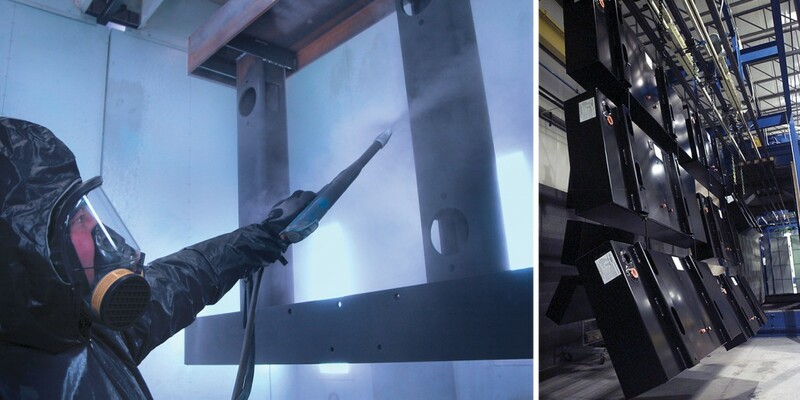 Most important for our customers; powder coating is a proven process that provides a far more durable and fade resistant coating that protects your fabricated product significantly better than a wet spray, and is more aesthetic. A wide range of colors are available. Modular fixturing for tight tolerance welding. United Alloy, Inc. has 34 overhead traveling bridge cranes with a load capacity ranging from 1 ton up to 20 tons. Our versatile band saws provide exceptional miter cutting for light to medium duty applications.